Pre-eminent young classical pianists from around the world will return to Loyola University New Orleans this month to perform at two events presented in conjunction with the Musical Arts Society of New Orleans. Both performances take place in the Louis J. Roussel Performance Hall, located in the Communications/Music Complex on Loyola’s main campus. “I am thrilled that Loyola and MASNO are working together, continuing to do the crucial work needed to keep the arts alive and vibrant at this important time. Roussel Hall is a treasure, a major center for artistic life in our city, and we are so happy to share it with others,” said Dean of Loyola’s College of Music and Fine Arts Donald Boomgaarden, Ph.D. The Concerto Showcase VII on Sunday, Feb. 24 at 3 p.m. will feature the winners of MASNO’s 2012 International Piano Competition in a program of rousing concertos with the Louisiana Philharmonic Orchestra. Gold medalist Viktor Valkov from Bulgaria will play Béla Bartók’s “Piano Concerto No. 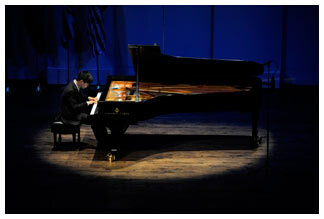 1,” silver medalist Sejoon Park from the U.S. will play Sergei Rachmaninov’s “Piano Concerto No. 2” and bronze medalist Evgeny Brakhman from Russia play Maurice Ravel’s “Piano Concerto in G Major.” Ticket prices for the showcase range from $20 to $73 and are available online or by calling 504-523-6530. In a solo recital Monday, Feb. 25 at 7:30 p.m., Park will perform a varied program, including Joseph Haydn’s “Piano Sonata in D Major, Hob XVI:42;” Ludwig van Beethoven’s “Piano Sonata in E-flat Major, Op.27, No.1;” Robert Schumann’s “Humoreske, Op.20;” and Enrique Granados’ “The Maiden and the Nightingale” from his piano suite, “The Goyescas.” The recital is free and open to the public. Park has won top prizes at numerous piano competitions, including the Oberlin Conservatory International Piano Competition, the Pianoarts National Competition, Eastman International Piano Competition, Southeastern Piano Concerto Competition and the Aspen Music Festival Piano Concerto Competition. He has performed at major venues across the globe and made solo appearances with orchestras such as the United Korean Orchestra, the Eurasian Philharmonic and the South Carolina Philharmonic, among others. For additional information on either of these events, visit www.masno.org or call 504-899-4826.